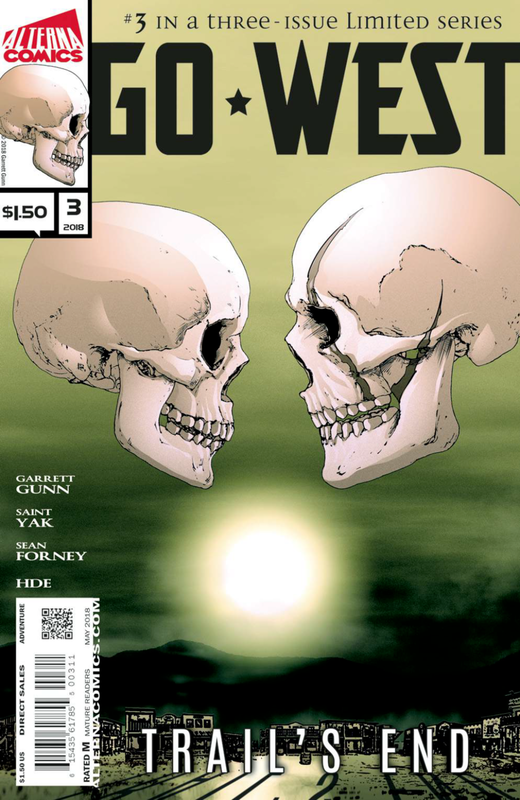 Go West #3 is the final issue in a three issue limited series published by Alterna Comics. While the first two issues were decent setup, the third act and finale fails to feel all that satisfying. The violence level is the same level of intensity and awesome, but story wise… you’re basically just getting a generic western in comic form. The futuristic element doesn’t do much for the story. When we left off, Slade was partnered with the chick from Lost Vegas, whose name I can’t even remember now. They were preparing for a final confrontation with a jerk named Creep who is responsible for the death of Slade’s wife and kid. They were calling in reinforcements and now those guys have arrived. They come in on motorcycles. The leader is a huge dude with a mohawk, known as Chief. He and his group are supposed to be this comic’s representation of a band of native Americans, complete with super sharp Tomahawks. Hands are sliced, heads are bashed in, there’s LOTS of violence, to the same intensity as the last issues. The action bits are great. I liked the art last time, but this time, it just doesn’t feel right. There are more colors, but for everything going down, it seems like it is just watering down the action to be fully honest. I would’ve like brighter blood splatters and maybe even just less color. For the arc of the story, I think it would’ve been better in full color or just black and white because this seems to be going for grit, but it misses the mark, big time. When Creep is finally getting his, it just isn’t as satisfying as I wanted it to be. The ending did nothing for me. I don’t care about the characters and I don’t feel like they’re really going to go in any further directions. There is really no need for them to and no reason to care. Oh yes, the girl’s name is Lilly, and last time I said she was cool. This time she doesn’t live up to the last issue. Sure, she gets in on the fighting in an epic way, but her dialogue is incredibly flat. Most of the dialogue is this time. Creep and Slade’s confrontation dialogue feels forced and clunky. One of the more unique elements of this story is the attempt to make it more futuristic despite being a western revenge tale. We’ve got motorcycles, but this part of the story doesn’t really get fully realized within the story. It ends up being almost useless to the overall story. It is just a twist that isn’t intriguing. They don’t really talk about the circumstances leading to Lost Vegas or how anything is affected by whatever happened. Things just are, which would be great, if it made sense as far as inclusion goes. If the setting isn’t relevant to the action, it doesn’t help. It is just confusing. The setting ends up looking like it could just be the old west, except that if it were, the reinforcements with Chief would’ve taken longer to arrive. So maybe the whole point of the setting was to speed up travel within the story? That is about all it is good for. Ultimately, this one just ends up being another generic revenge story, with an unsatisfying ending. If you just like western themes, then the price isn’t bad, but this comic is not the next best futuristic western story. Issue #2 was the best one, setting us up for lots of excitement that just didn’t get delivered in act 3.